It’s one of the greatest sports events on the planet, and this Sunday (11/4) the New York Marathon will wind its way through our area. 50,000 competitors will pass down Manhattan Avenue and it is one of the very few world-class sporting events you can see live and for free. For better or worse, the race will also close off Manhattan Avenue, Greenpoint Avenue and part of McGuinness Boulevard for several hours; moving in, out and around our area will be tricky. 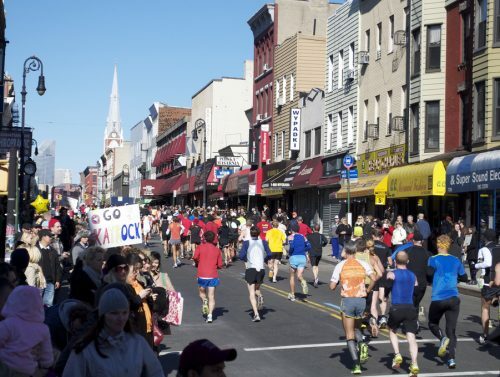 Despite the minor inconvenience, the race is still a spectacle to behold and Greenpoint is one of the best places in the city to watch the drama of the marathon unfold. The race starts in Staten Island and crosses the Verrazano Bridge into Brooklyn on its twenty-six-mile journey (PDF) through each of the five boroughs, ending in Central Park. The participants hit Williamsburg at about mile 12 and our area at mile thirteen- the halfway point in the race. Professional women start at 9:20 a.m. and they should reach our area about an hour and 10 minutes later. 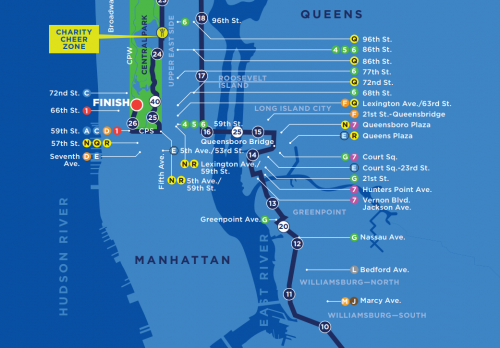 Professional men start at 9:50 a.m. and should reach Greenpoint a little more than an hour after. The huge number of runners is staggered in waves, so for a few consecutive hours runners will pass through North Brooklyn. The pace that elite runners move at is mind-boggling. The male athletes will average less than five minutes per mile for the 26-mile span, and the top female athletes will run about 40 seconds per mile slower than the men. Many average runners will hope to complete the course in the four to five-hour range, but for every runner it will be an achievement that they will never forget. The best athletes, male and female, are almost exclusively East Africans. 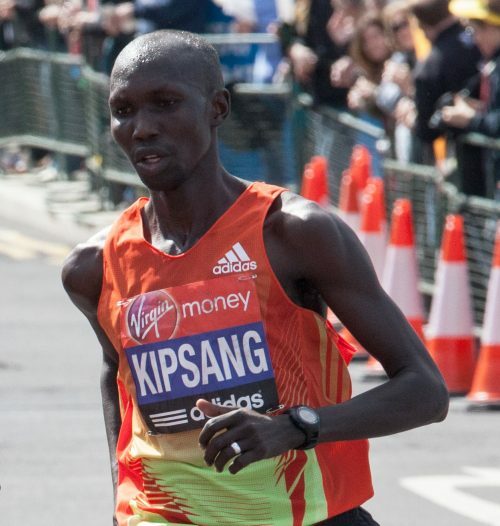 On the men’s side Kenya’s Geoffrey Mutai (2:03:02) holds the course record, his countrymen Wilson Kipsang (2:03:23) and Gebre Gebremariam (2:04:53), as well as Ethiopia’s Lelisa Desisa (2:04:45) are all contenders for the hundred thousand dollar prize. 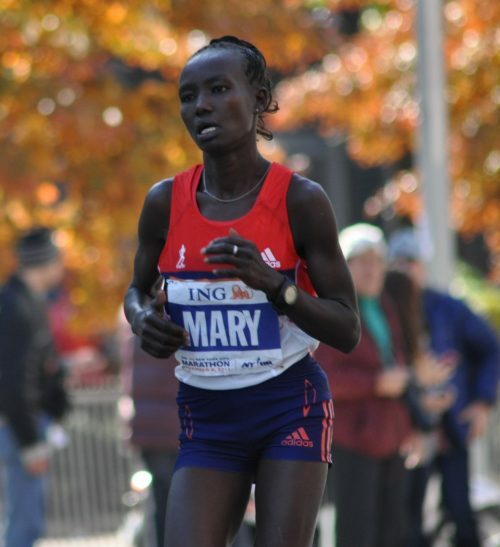 On the women’s side, there are two favorites, Kenya’s Mary Keitany and Ethiopia’s Buzunesh Deba, both of whom could break the 15-year-old course record of 2:22:31. Keitany has not run a marathon since she gave birth to her second child, after finishing fourth in the Olympic marathon in London. Thousands of runners from all over the world take part in the event, so it is a truly international field. Polish athletes love running through the area because the large local Polish community gives them big encouragement, but runners from every country appreciate the cheers and support they get in our area, so come on out and give them a few cheers and enjoy a unique spectacle.